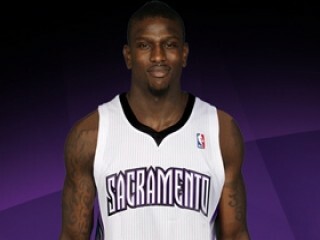 Birthplace : Eustis, Florida, U.S.
Jermaine Taylor is an American professional basketball player for the Sacramento Kings. Taylor was a starting guard for the University of Central Florida basketball team. He was drafted in the second round, 32nd overall, of the 2009 NBA Draft by the Washington Wizards and soon after traded to the Houston Rockets. In his rookie season with the Rockets, averaged 4.1 points and 1.5 rebounds in 31 games (four starts) … DNP (CD) for 40 games … on the inactive list for 11 games … overall, notched 10 or more points three times and had one double-double … actually reached double-digit scoring in each of his first three NBA starts … saw action in his first regular season NBA game at Utah … scored the first five points (5-6 FT) of his career at Dallas … recorded two blocked shots at Cleveland … made the first start of his career vs. the L.A. Lakers (3/27/10), notching a career-high 15 points (6-14 FG, 3-4 3FG), five rebounds and three assists … recorded 14 points (6-13 FG) in another start vs. Washington (3/30/10) … posted 14 points (5-15 FG), a career-high 10 rebounds and a career-best four steals in 34:13 of action in a start at San Antonio (3/31/10) … added a fourth start at Boston (4/2/10) … assigned to Houston's single-affiliation NBA D-League partner the Rio Grande Valley Vipers on Jan. 28 and recalled on Feb. 4 … re-assigned to Rio Grande Valley on Feb. 19 and recalled on Feb. 23 … re-assigned to the Vipers on Mar. 17 and recalled on Mar. 24 … averaged 19.8 points, 4.8 rebounds, 2.1 assists and 1.25 steals in eight games (four starts) with Rio Grande Valley … posted back-to-back 30-point outings with the Vipers at Albuquerque (30 points on 2/2/10 and 32 points on 2/3/10) … also averaged 11.0 points and 2.3 assists in four games (two starts) with Houston in the 2009 NBA Summer League. Just the second NBA Draft pick in UCF history, joining Bennie Shaw, who was selected in the ninth round by the Milwaukee Bucks in 1976 … averaged 16.2 points (.466, 710-1524 FG) and made a school-record 251 3-pointers (.376, 251-668 3FG) in 122 games (60 starts) over his four-year career at Central Florida … finished as UCF's career scoring leader at the Division I level with 1,979 points … overall, ranked third all-time at UCF in points and fourth on the Conference USA career scoring list … as a senior, was named the C-USA Player of the Year and earned All-Conference USA First Team honors … ranked third in the nation in scoring with 26.2 points per game (.480, 291-606 FG) and netted a school-record 812 points during his senior campaign … set the C-USA single-season record by notching 466 points in conference play (29.1 ppg) … had nine 30-point performances and one 40-point game in 2008-09 … connected on 92 3-pointers (.376, 92-245 3FG), which ranked fourth on the school's single-season chart … earned C-USA Player of the Week honors on five occasions during his final collegiate campaign … established a UCF Division I single-game record with 45 points (14-29 FG, 5-13 3FG, 12-13 FT) vs. Rice (2/25/09) … earned All-Conference USA Second Team selection after leading UCF in scoring with 20.8 points per game (.461, 231-501 FG; .367, 79-215 3FG) as a junior, ranking fourth in C-USA and 23rd nationally in scoring in 2007-08 … appeared in all 31 games as a reserve during his sophomore campaign, ranking second on the team and 16th in C-USA in points per game (12.7) … also ranked fourth in C-USA in 3-point field goal percentage (.414, 63-152 3FG) … C-USA Commissioner's Academic Honor Roll recipient as a freshman … was one of just six Knights to appear in all 29 games in 2005-06. Born Jermaine Taylor on Dec. 8, 1986, in Eustis, Florida … grew up in Tavares, Florida … nickname is J.T. … son of Gwendolyn Taylor … favorite movie is The Hangover … lists all-time favorite TV show as The Fresh Prince of Bel-Air … favorite athlete growing up was Michael Jordan … majored in criminal justice at Central Florida … as a senior at Tavares High School, earned Lake-Sumter Player of the Year and All-Central Florida First Team honors from the Orlando Sentinel … was also the Leesburg Daily Commercial Boys Basketball Player of the Year and the Class 3A-District 8 Player of the Year … finished second in the Florida Class 3A Player of the Year voting and was named to the Florida Class 3A All-State First Team … added Leesburg Daily Commercial 2004 All-Area Football First Team selection at wide receiver as a senior at Tavares … also finished second in the Florida Class 2A Track and Field Championships in both the triple and high jumps … named Leesburg Daily Commercial Boys Track and Field Athlete of the Year … set the school's high, long and triple jump records … played AAU since the third grade. View the full website biography of Jermaine Taylor (basketball).